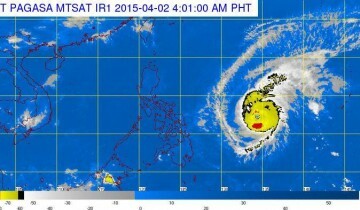 Typhoon Chedeng is expected to make landfall in Central and Southern Luzon on Black Saturday. Cebu may experience a rainy weekend. National Bureau of Investigation (NBI) 7 agents seized yesterday P3 million worth of used clothing or ukay-ukay in Barangay Looc, Mandaue City. Pag-asa 4 a.m. weather advisory estimates eye of Typhoon “‪#‎ChedengPH‬” at 980 kilometers east of Borongan, Eastern Samar. Even if the province is not directly in the typhoon’s path, the local government units (LGUs) of Cebu Province, Cebu City and Mandaue City, and the Office of Civil Defense (OCD) 7 assured the public that Cebu is ready for bad weather. Chedeng may rain in Cebu and parts of Central Visayas before it makes landfall in Luzon on Black Saturday, according to Oscar Tabada of Pagasa (Philippine Atmospheric, Geophysical and Astronomical Services Administration) Mactan. As of yesterday morning, the typhoon is moving to the Philippines with sustained winds of 190 kilometers per hour (kph) and gustiness of 225 kph. It is about 30 kph short of a super typhoon. The OCD directed LGUS to identify evacuation centers in their towns and cities. It convened the Pre-disaster Risk Assessment core group (composed of the OCD, Philippine National Police, Pagasa, Department of Social Welfare and Development, Philippine Information Agency and National Economic and Development Authority) yesterday to discuss measures being implemented. LGUs under Cebu Province have become more vigilant and activated their disaster offices. PDRRMO started preparing food in case the typhoon hits any part of Cebu and started distributing last night the remaining satellite phones to mayors. Cebu Gov. Hilario Davide III met with department heads yesterday and asked them to get ready for the typhoon. The Mandaue City Government will have rescue vehicles and heavy equipment on standby starting this afternoon. In Lapu-Lapu City, all disaster responders and vehicles are ready, as well as relief goods. The Cebu City Disaster Risk Reduction Management Council (CCDRRMC) placed Cebu City under “alert level alpha” since yesterday for typhoon Chedeng. The public is urged to help by monitoring the movement of Chedeng. Two weeks after NBI 7 raided an ukay-ukay warehouse in Barangay Paknaan, Mandaue City, the same agency seized worth about P3 million from a Korean-owned warehouse in Barangay Looc, also in Mandaue City yesterday afternoon. The agency caught three Filipino workers unloading the clothes, stuffed inside yellow sacks, from a 40-foot cargo container past 3 p.m. The used clothes were shipped from Cagayan de Oro where the clothes arrived from South Korea. Importing used clothes is illegal under Republic Act 4653, which was enacted to protect the people against the risks of wearing used clothes from outside the country. Based on a business permit issued by the Mandaue City Government, Kim Sang Yeon, 45, owns the San Woo Ri Phil Inc. that which owns the warehouse. The NBI 7 will investigate the involvement of Kim who said that his Korean friend owns the company that is registered with the Department of Trade and Industry as a seller of dry goods.